5th July (2013) saw the team of Chepstow Plant Services employees, business colleges, friends and family embark on the fearsome 3 peaks challenge. The team of 14 people began the climb of the 3 largest peaks in Scotland, England & Wales within 24 hours – at the Base of Ben Nevis at 4.20pm - the Dudes were off! Don’t be fooled into thinking that this challenge was just a gentle saunter up and down the mountains of Scotland, England and Wales – no! The 3 peaks challenge was an exciting adventure that had all involved taking home stories that they will be telling for a very long time. It was not to be taken on by the faint hearted - a demanding 24 hour endurance test that challenged the fittest and most adventurous walkers amongst them. 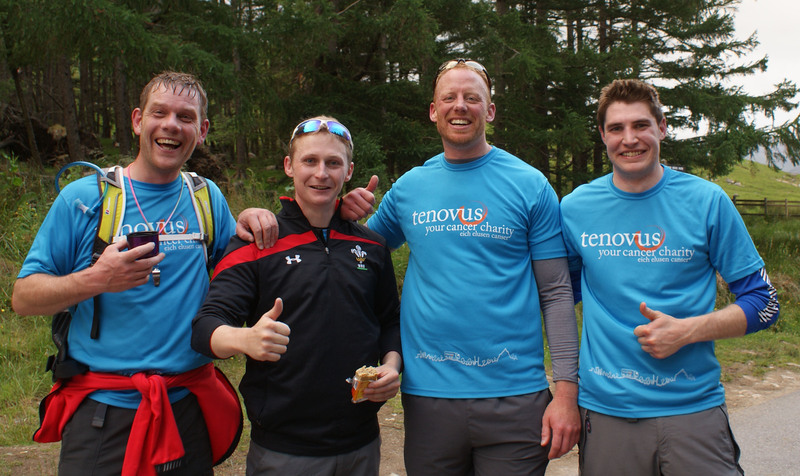 The Chepstow Plant Services team were taking on the challenge for several reasons but the biggest had to be to raise funds for a cause that is close to everyone hearts – Tenovus! The first mountain was conquered Ben Nevis 4,406 ft the highest peak in Scotland in under 3 hours by the first man home Hywel Curtis! An amazing feat when you realise the recommended time for this peak is between 4 and 5 hours! Before the 4 hour mark ticked by the team were off to the next peak, Scarfell the highest peak in England – would they still be eager to walk after 6 hours in the car?